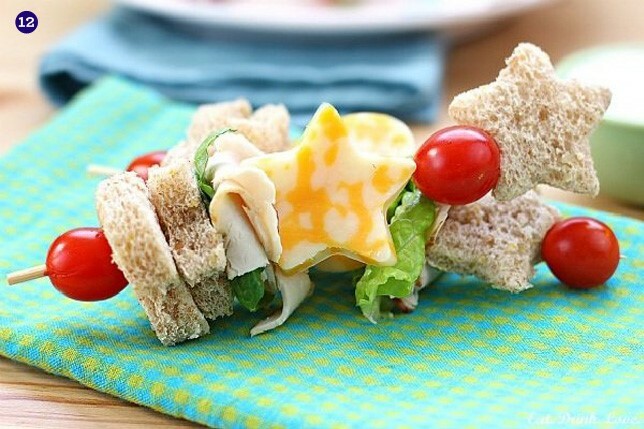 A Fun Way to Serve a Meal or Two! Anyway, Something On a Stick Day celebrates things on a stick. (I can hardly keep a straight face typing this.) It's kind of a cool day though-full of all sorts of possibilities. So what comes on a stick? Practically anything. The first things that come to mind are popsicles and fudge-sicles. Then of course, there are hotdogs (over a campfire). And what about corndogs, and shrimp kabobs? We can't overlook many Chinese treats and those darling cocktail wieners paired with cheese cubes, either. If we run out of ideas, we could always follow the example of the Costco demonstrators who serve up samples of just about anything on sticks (toothpicks, in this case). Historically, research shows the tradition of food-on-a-stick originated at a state fair (which one, I don't know) in 1947. 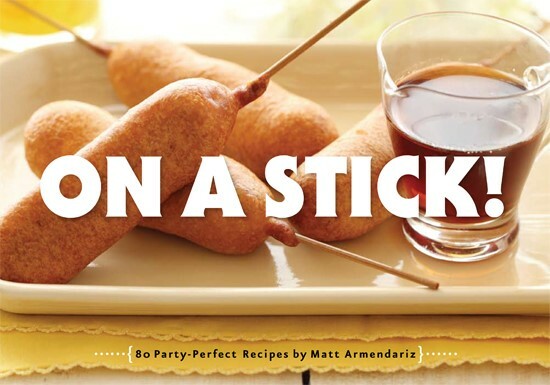 It all started with the introduction of the Pronto Pup, a corn dog-like deep-fried hot dog encased in a pancake batter coating. Things just kept getting better. The modern food-on-sticks era can be traced to the influential 2001 state fair season of the deep-fried candy bar-on-a-stick. And when macaroni and cheese-on-a-stick was introduced the following year, it was game on; competition and creativity merged as vendors vied to outdo one another to create the best-selling, the tastiest, and the most outlandish food-on-a-stick. The trend isn't in danger of fading, either. Food on a stick, especially the fried variety, is a real crowd pleaser. So now just about anything shows up on a stick. For instance, deep-fried kosher pickles, deep fried bacon cheddar, deep fried mashed potatoes, and turkey stuffing-on-a-stick (the last two of which emerge from the oil like over-sized bread-crumbed lollipops) are just a few of the zany things people are now eating on a stick. Wisconsin, Iowa, Arizona- they all have their stick cultures, but nowhere is the competition fiercer and the passion more fervent than at the Minnesota State Fair. 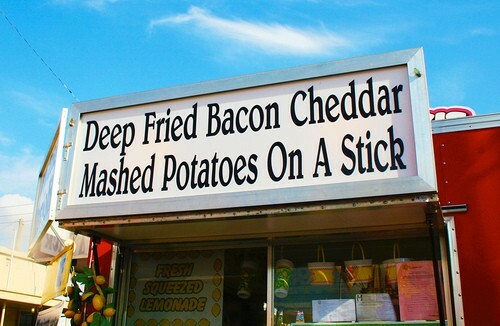 One-upmanship has resulted in 81 foods-on-stick at last year's fair, known as the Great Minnesota Get-Together. 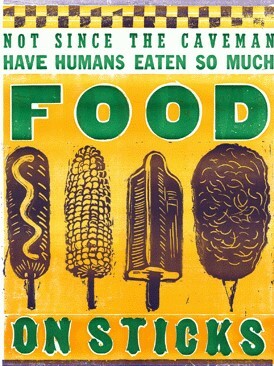 As they say in Minnesota, "If you can't eat it on a stick, then my goodness, why bother eating it at all?" The author is a seasoned food blogger, food stylist, and famed food photographer. I'm told one of the things that really makes this book shine is the inclusion of several dipping sauce recipes. Well sure, ya gotta dip the food-on-your-stick, for pete's sake! If you've read this far you might be thinking "WHERE is she going with this blather?" First, I thought it was a cool day to talk about. But second, which is really my point, I thought you'd appreciate some ideas regarding things you can serve on a stick (besides all the heart-attack-waiting-to-happen fried stuff). And think about it-this is a smart way to minimize the after-dinner dishes, too. So take a look at these clever ideas and think about enjoying Mar 28 over a meal or two served on a stick. How about a sandwich on a stick? These were served as part of an outdoor summer wedding reception. 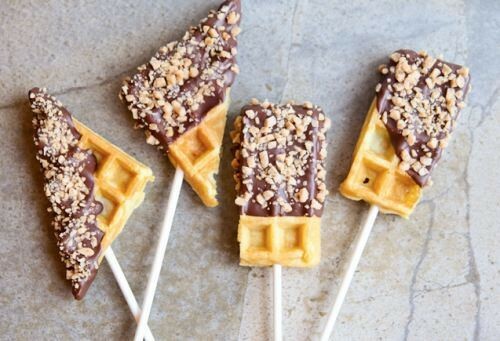 Or who could resist these toffee waffle bites? 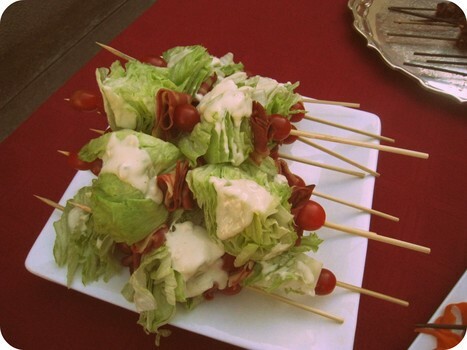 And let's round it all out with salad on a stick. A Thinner Pizza Crust Than New York Style? Where can I buy Space Food Sticks? Is Oven Rack Position Important? Been there. Done that. Today. The #1 parenting pro tip.